I was away this weekend on a cruise with several WordPress friends. While on the boat, one of my friends said, “You know what I would love to have you write about…” and went on to explain what she wanted to hear about. I wrote about that very topic yesterday. Just days after she asked about it. But being gone for the weekend also meant I wasn’t paying attention to any stats. 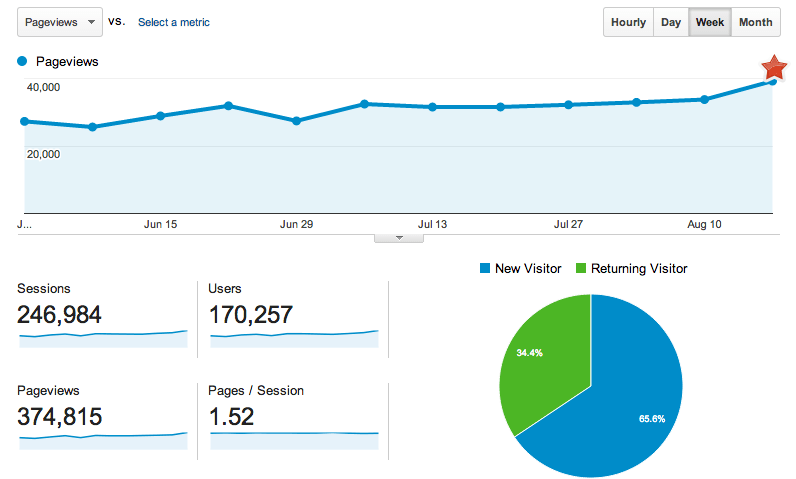 So when I got home yesterday I noticed I was about to hit a new weekly high – 40,000 pageviews in a single week. Not bad for my little blog. Thankfully, so far, it’s not come down. Just a slow and steady increase, week by week, over the last two years of daily blogging. Now you might think that there’s no way you could do this, but I want to tell you that I think there’s a good chance you could do this. If you wanted. I’d also be the first to tell you that there’s nothing wrong with blogging every few days, every week, or every month. If you have something to share, that would help someone, do it. Yes, there’s a lot of posts out there. But if yours are helpful, and Google knows how to find them, then you’ll be helping someone else when they ask Google their big question. And that’s more important than worrying around away about your consistency. Worrying about your consistency before even writing anything is a little like worrying about the brand of tennis shoes you’ll wear while you’re still an infant that doesn’t yet crawl. So here are my secrets. First, give away your best stuff. I’ll be honest. That phrase, “best stuff,” and the idea of giving it away isn’t mine. I stole it from Chris Brogan. But it doesn’t make it any less true. I’ve learned a lot from Chris, but one of my favorite lessons is to just focus on being helpful and getting the information out there for folks. He has a newsletter you might like. I like it. And I also have one (over there on the right). So anytime you have an insight or idea that you think is golden – write it down somewhere (I use Evernote). Then look at it from several angles to see how to make it even better or more applicable, and then write about it. You can always turn it into an information product (eBook, eCourse, etc) later. But just get it out there. I’d say that I have one of those posts on average every week or two. That’s only 25 big ideas. I bet you have 25 insights that you could share with people. Sure it won’t fill up a daily blog, but those 25 will be very helpful to people and that’s what counts. Second, write to several people, not just one. I don’t write for one single person. If I did, this blog would get overly narrow. Sometimes people don’t understand it when I say that you should focus on a theme, but at the same time, not narrow your scope too much. Notice what I’ve done? I’ve linked several different audiences with the common thread of WordPress. This helps me because it keeps me interested in writing (after all, writing to one kind of person over and over gets tiring). But it also helps me relate one post to another, carry forward a theme, or reference old posts because they’re all topically linked by the notion of a WordPress-oriented blog. By having five different targets, I can focus on a different one each day, if I like, and never get too bored or stilted. By simply asking myself what these folks need to hear, I come up with one or two ideas a week, easily. Third, listen for people’s questions. I spend time on Twitter. I spend time in Facebook groups. I run a meetup. I answer questions on Clarity. And I hang out with friends. In every one of those settings, I’m listening for one of those five kinds of folks to raise a question. Because I know if they have a question, it’s likely that many more people like them also have that question. Then I write a post to answer the question, as best as I know how. Tip: Don’t wait to get a perfect answer. Sure, some folks will troll you because maybe you missed something, but keeping your answer relatively close to when a question was asked is pretty helpful. I’d guess that 3 posts a week are driven by questions I’m hearing out there. Fourth, have an independent opinion. Now, here’s what I do. I write down the title. It’s clearly what sparked the idea in my head. But I don’t go read the post. Because I don’t want to be influenced by it. I also don’t want to intrude on that author’s limelight for their recent post. So I wait 3-4 weeks. Then I write my own version. After it’s written, I go back and read theirs and if there’s anything worth linking to, I go back to mine and add a reference. It’s my own version of a hat tip. Again, I think that’s probably only one post every week or two. Notice that we’re up to 6 posts a week already using these strategies. While I don’t write a personal post every week, I probably do every two weeks. People who read your stuff regularly may already feel like they know you a bit more. But personal posts, every now and then, really help to cement that relationship and broaden the trust you’re developing with your audience. So every two to three weeks, I write a personal post. Again, not every week, but every two or three weeks, I’ll write a post about a friend of mine who deserves a spotlight on what they’re doing. The spotlight helps your audience get to know them. But it also highlights that you’re not just writing about yourself all the time. You’re willing to share the spotlight. Additionally, those you spotlight may not only share your material, but even write or send people your way. It’s the rule of reciprocating relationships and it works even when it comes to blogs. But wait…did you want blog content topics? I know, maybe what you were wondering wasn’t how I approached getting ideas for seven posts a week. Maybe instead you were hoping that I would give you topics to write about. Guess what? My friend Chris Brogan already did that. So go check out his 100 blog topics.